I must admit going to a concert or some other live event is my idea of the best way to spend a Sunday night. This Sunday, I was looking forward to a concert with a sense of anticipation you only get when catching up with someone you haven’t seen for an age or seeing a new band or performer for the first time. On this occasion I was going to see a band I had never actually seen or even heard of, but somehow I knew I would enjoy Calexico and their style of music which I perceived to be latin in influence. This event would also bring my Celtic Connections 2015 to a close. This automatically meant I had a deep sense of sadness as I always do when we finally reach the last night of the festival I like to call the Celtic family gathering. To me if Celtic connections is about anything it’s about a community a family who may not know all the names of every relative the family is far too big for that but get together every year when the music calls us home. This time I made it to Old Fruitmarket with plenty of time to spare. This was due to the fact I had been for a girlie pampering session in the Parkhead area just a few yards from home of a certain well known Glasgow football club with whom you could say I had a connection. The fact I was lucky as l got a bus in to town also helped. On arriving I found the venue to be very busy and Calexico to a very popular band with many people seeing them for the 10th time or more. On entering the arena I got gabbing as is my way to Linda and Julie a mother and daughter from Northumbria and discovered that the daughter Julie had seen the band so many times she had lost count. This must be like me and Yuptae, Rachel Sermanni, or Lori Watson of whom I am a massive fan. Julie assured me I would enjoy a brilliant night and have an experience I would never forget and how right she was. It was a fantastic night of entertainment from a band of highest quality not to mention an amazing support act. Hey wait a minute, I’ve just realised I said not to mention an amazing support act. Well I think I had better mention them because believe me they were brilliant. This is not the first time I had seen the Kris Drever Band, truth be told I have seen them many times over the years and knew the quality of the band and their work unlike many others in the hall as they were not the billed support but were asked to stand in for the original support only the morning before the gig as BC Camplight had visa issues. Being the good guy he is, Chris readily agreed to the request as get this he was going to the gig anyway as he had been in a fan of Calexico since his schooldays. Introductions over it was time for Mr Drever and the band to do what they do best namely entertain an audience who were in the mood for good quality music. That is exactly what they got from a band who are in my opinion a headline act fit to grace any festival with songs and musicianship of the highest calibre. Kris started his set with Beads and Feathers before moving on to one of the highlights of the evening and playing a new and as yet untitled song which he says will be called either Don’t Tell Me or Don’t Tell Me That. I know this because I chatted to Kris on facebook yesterday and suggested Don’t Tell Me as that seems to be the narrative which runs through the song. However rather than any negative connotations which people who jump to conclusions would find in this number,I found it to be inspiring in the sense that I listened to the lyrics in the song and found it was speaking to me and saying that rather than moan about the problems in society why not be the change you want to see in the world. At the end of a set which was all too short Kris finished with the brilliant Harvest Gypsies. This song is a biting social commentary on the way we treat others, particularly seasonal migrant workers who travel to countries to take the jobs the locals won’t touch. The lyrics tell the story of a group of people who are all too often marginalised within societies, whilst the melody gives it that moody, haunting, air which let’s you know there is a real story to be told here. After Kris and the band finished his set and were able to take their place in the audience it was time for the main event of the evening. From the moment Calexico took the stage I knew I was in for a musical extravaganza with something to suit every taste and believe me I wasn’t wrong. This was my first time seeing Calexico and it certainly hope it won’t be my last. Whilst not as raucous or as foot stomping as the Chair whom I saw last week at the same venue this was also top quality and they took us on global world tour with music from their native Arizona and tunes from Algeria various parts of Latin America, Spain and I also detected the French influence in the jazz of old New Orleans as the mariachi music for which there fans tell me they are renowned. A Calexico concert is not just a global event in terms of musical cultures, it is also a fusion of musical styles from the country/country rock of their native USA, Jazz, and Latin American. As I said to one audience member this band have more musical styles than there are dances on strictly come dancing. I have to say my favourite songs of theirs came from the country rock tradition. Did I spy a wee bit of an Eagles influence in their set? I think I did and that for someone brought up listening to the Eagles in the mid to late seventies that is no bad thing. This was a night that passed quickly. Too quickly in my book as I could have coped with a lot more of this highly entertaining band. To me a Calexico concert isn’t so much a concert in the traditional sense, it’s more of an entertainment experience and it is something I will I hope experience again. This band believe in giving value for money and when the time for the curtain call came, they not only came back for an encore they played about four or five extra songs and left their fans including this new one with beaming smiles on our faces. As is traditional for me i chatted to members of the audience to find out where the fan base had come from. Well I can’t help being a geographer and a good demographic study is the perfect way to end an enjoyable Sunday evening. Apart from the lovely Northumbrians I spoke to at the beginning of the evening I met fans from Bathgate, Fife, Lanark, Orkney, Shetland, as well as Canada, England, Ireland, Italy and the USA. This was an event with a truly cosmopolitan favour on stage and off. An event which had me thoroughly entertained from start to finish I have to say though, much as I enjoyed an excellent headline for me the highlight of the evening was Kris Drever’s performance of Harvest Gypsies. The lyrics of this song leave me truly mesmerised every time I hear them. It really is a warning to the world to change the way we view others and maybe in the words of Robert Burns to see ourselves as others see us or at least to try and if we can do that we may have a world where dreamers can dream musicians can play, singers can sing, poets can be inspired, and together we can all share our stories in whatever way we’ve been gifted. “That’s good, I was going to be here anyway,” joked Kris Drever as he took to the stage at The Old Fruitmarket. Having to stand in at the last minute for BC Camplight’s visa-induced no-show his trio ran through a short but engrossing set showcasing his fabulously clear vocals- a couple of numbers being decided on the spot. The instrumental interplay with fellow guitarist Ian Carr at times evoked the best days of John Renbourn and Bert Jansch. Kris Drever must surely be regarded as a major talent now on both the Scottish and international acoustic music scene. 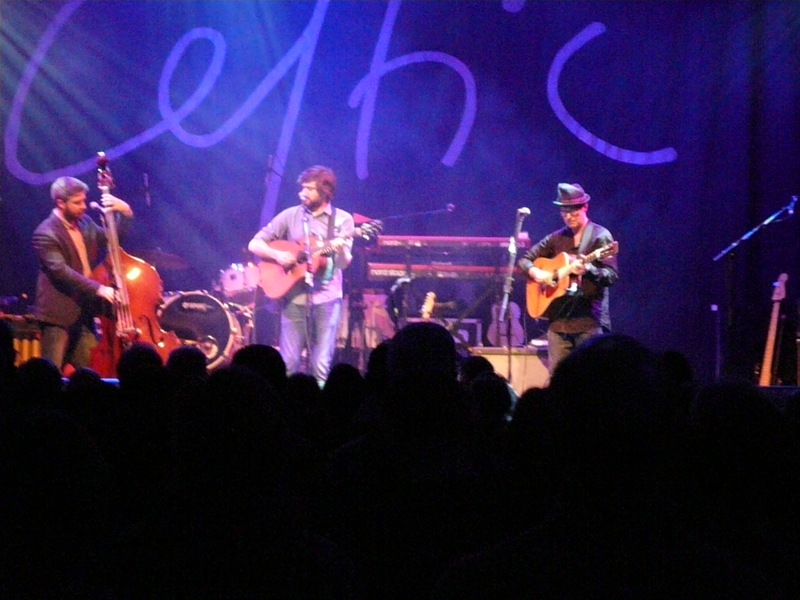 Even though several other Final Night Celtic Connections events were taking place simultaneously in various other venues, Calexico came on stage to huge applause from a practically sold-out audience of all age groups. The seven-piece band led by founder members Joey Burns and John Convertino set the tone for the evening with several numbers from their as-yet unreleased album Edge Of The Sun which prominently featured the twin trumpets of Martin Wienk and Jacob Valenzuela- a live-wire performer who kept the crowd entertained throughout. Using their multi-instumental talents Calexico were able to conjure up everything from from Bossa Nova to reggae with Mariachi, rock and Ameicana in between. With so many diverse musical strands on offer however, the band seemed sometimes to lose focus a bit-particularly on a long-winded rock anthem version of Joy Division’s Love Will Tear Us Apart. In contrast, the other cover of the night, the Love classic Alone Again Or,worked brilliantly well with the trumpet duo capturing the originals’ sparkling Spanish-tinged arrangement perfectly. Another highlight was an almost acapella version of Fortune Teller featuring Joey Burns over sparse acoustic guitar. 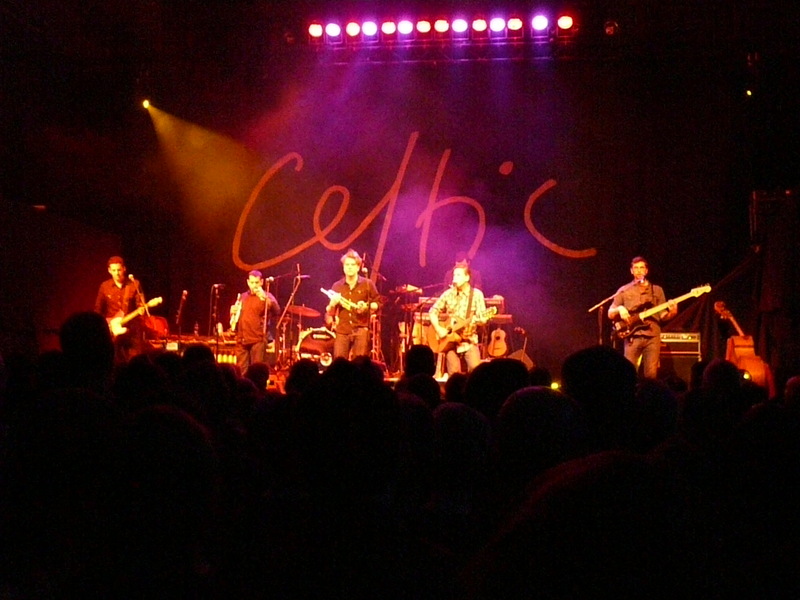 The encore saw the band whipping up the crowd in to a Tex-Mex frenzy with much whooping and hollering,then,after a couple of group bows they were gone, leaving the crowd shouting for more and bringing another fine season of Celtic Connections to a close.